PART OF THE SOUTH FLORIDA COMMUNITY SINCE 1980. "GOOD OLD FASHION CUSTOMER SERVICE YOU CAN RELY ON" WE WOULDN'T HAVE IT ANY OTHER WAY! Our team is comprised of hand picked, trained technicians with a strong customer service focus. Our team is standing by 24/7! 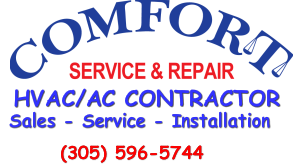 FREE Service call with AC repair. We repair, service and install all brands of equipment and are proud to service Miami-Dade, Broward Counties and the surrounding areas. SAME PHONE NUMBER: (305)-596-5744 "(28 YEARS), and counting!" We, are fully Licensed (CACO12857) and Insured, and with more than 30 years in business and 70 years of combined management experience, you can trust that we will be here to take care of ALL your AC services needs. IT IS OUR, commitment to provide you with quality service at the best possible price. We value your business and strive to always keep our prices competitive while keeping your best interest in the forefront of our business. We service all makes and model!